Éphémère Elderberry features a slightly cloudy and seductively reddish color with purplish hues, topped by a creamy pink head. 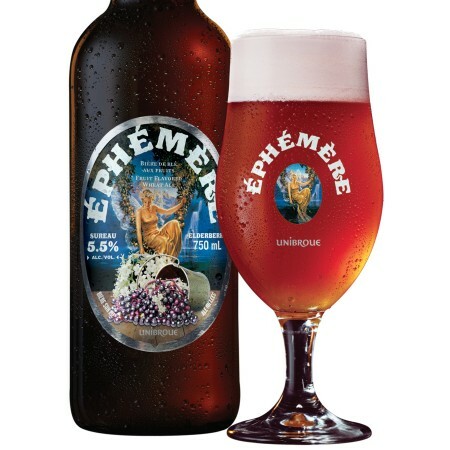 “This is the first time we’re using both the fruit and flower in making an Éphémère beer,” explains Jerry Vietz, Unibroue’s Master Brewer. “The elderberry flower’s aroma is a perfect complement to the fruit’s rich, delicious flavour.” In fact, its berry flavours, subtle floral notes and hints of tropical fruit evoke Muscat grapes’ notable bouquet from the very first sip. Éphémère Elderberry/Sureau is in stores now throughout Quebec in both 341 ml and 750 ml formats, and it will also be available in other select regions of Canada in coming weeks. For more details on availability and pricing, check with local beer retailers.